2014: The Year of Wearable Technology? The future of technology? Looks like we’ll be wearing it. If we’d said this just five years ago you would probably have laughed, thinking we were coming out with some futuristic spiel. Fashion weeks have often seen Jetson-inspired pieces sent down the runway as retro-futurism falls in and out of vogue, but what we’re talking about here is far more practical – and it’s happening now. As we reported last month, Google Glass could soon be launching through Mr Porter. In addition, online retail giant Amazon has just launched a dedicated wearable tech store here in the UK. With the biggest online designer menswear retailer – and the biggest retailer, full stop – on board, it looks like wearable tech is about to get a whole lot more accessible. But how do you really feel about wearable technology? Is it actually any good? And even if it is, will it ever be seen as stylish? We explore the topic this week by looking at some of the key players in the current market and considering how you could begin to integrate these items into your wardrobe. What Actually Is Wearable Technology? Wearable technology might be a buzz term right now, but that doesn’t mean all of us are up to speed as to what it actually means. Essentially, wearable technology is what it says on the tin: electronic technologies or computers incorporated into items of clothing and accessories that can comfortably be worn on the body. These designs usually incorporate practical functions and features designed to make life easier – answer phone calls, access the internet, show your current location, etc. – although sometimes they’re purely included for aesthetic purposes (think those terrible t-shirts with scrolling LED slogans you can set yourself). The first piece of wearable tech we’re looking at is probably the most well-known. Google Glass is a wearable computer with an optical head-mounted display (OHMD), allowing the user to see information in a smartphone-like hands-free format. The wearer accesses the internet and other functions through voice commands – turns out the future really is here! Google began selling Google Glass to the general public in the US back in May this year for $1,500, while here in the UK we’re still waiting for an official release – it’s currently in the prototype testing stage, though, so it shouldn’t be too much longer. The concept of Google Glass gets our vote, although there’s always the danger of data overload and tech dependency – especially when most of us already spend nearly every waking minute glued to our smartphones and tablets. Yet the real problem with Google Glass for any style-conscious male is that the eyewear itself doesn’t look aesthetically pleasing. At all. However, this should change moving forward, with Luxottica, owners of Ray-Ban and Oakley, said to soon be offering additional frame designs. Realistically, it all depends on the frame you choose and whether the technology can be incorporated more seamlessly into future designs. As the hardware develops (read: reduces in size) and legitimate fashion brands such as Ray-Ban start to take the concept seriously, we assume that frame shapes will begin to resemble the classic wayfarer, clubmaster and aviator silhouettes we all know and love. If this is the case, you would be able to slot them seamlessly into any of your existing warm-weather outfits. As for the launch model, its bulky and futuristic design means you cannot simply ‘blend’ it into an outfit. Remember, in its current form, this should still be considered a piece of technology, not an outfit accessory. If you are one of the first adopters, or intend to be, etiquette dictates that you remove your glasses in social situations. Don’t be a ‘glasshole’. Next up we’re looking at the Moto 360: an Android Wear-based smartwatch revealed by Motorola earlier this year. A round face design, the Moto 360 uses a circular capacitive touch display, which is housed in a steel casing. The timepiece features wireless charging, a removable wristband and is water resistant. In terms of what it’s actually capable of, Google’s recent I/O 2014 Keynote event didn’t address the Moto 360 specifically, but it did demonstrate what many of these new Android Wear watches would be capable of, including voice commands for sending texts, getting directions and music playback, along with being able to receive and dismiss notifications, accept or decline calls, and dictate notes and reminders. Although we’re yet to receive a release date for the Moto 360, we’re expecting to find out sometime this summer. Far more slick and stylish than Google Glass’ range of eyewear, we can definitely see dapper gentleman everywhere giving their sartorial look a contemporary update with a Moto 360. We love how the futuristic accessory nods to timeless style through its classic shape, which almost reminds us of Uniform Wares’ acclaimed range of timepieces. Whether guys are actually willing to swap their phone for a watch is still unclear though. Likewise, if you already own and wear a prestige/luxury watch on a daily basis, would you be prepared to leave it at home in favour of a smartwatch? We’re not so sure. A well-tailored suit is a great place to start when it comes to wearing a smartwatch. A slick navy version from the likes of Reiss or Suitsupply will look delightfully dapper paired with the James Bond-inspired Moto 360. We recommend opting for a traditional cut in a clean cloth to both contrast and complement the futuristic technology perfectly. Try going tie-less for a minimal look that will bring the focus down to your new piece of wrist candy. This next piece of wearable tech aims to improve our health by tracking how we sleep, move and eat. Simply pair the UP24 wristband with your smartphone to keep an eye on whether you’re exercising enough, eating the right things or getting enough rest. Our favourite feature is the ‘Smart Alarm’: the wristband vibrates to wake you up at the optimal moment in your sleep cycle so you feel refreshed in the morning. Wave goodbye to getting-out-of-bed dread. What’s more, there’s no waiting list for this clever wristband – the UP24 by Jawbone is available now. The UP24 wristband features a minimal design that won’t make you look like a stereotypical gadget geek. The way it interacts with your phone means it doesn’t need a screen, therefore it’s small and discreet compared to many other wearable tech pieces. Our only concern is the concept of wearing the strap all the time, even during the night – we’d get sick of wearing a custom platinum Rolex twenty-four hours a day, let alone the UP24. This one’s easy – its minimal black aesthetic works with almost anything. Play up to its health conscious reputation by opting for an on trend sports luxe aesthetic. Once you’ve paired the wristband with your smartphone, try combining with black Nike Flyknit trainers, skinny charcoal jeans, a classic white tee and luxe suede bomber jacket. It’s worth mentioning that there’s a very strong chance an Apple iWatch is currently in development. Although the company has made no official announcements regarding a smartwatch – they like to keep their cards close to their chest – many industry observers suspect a debut model will be announced at a special event this October. 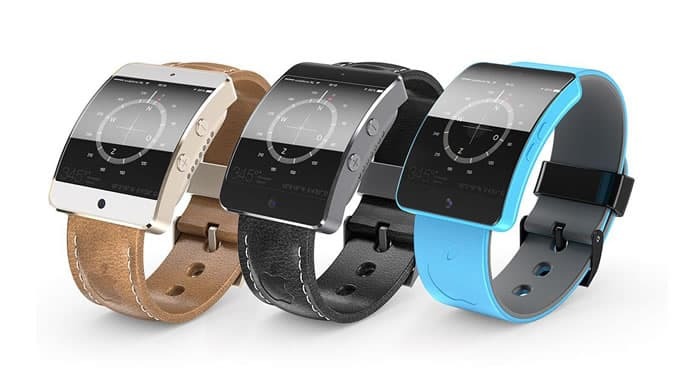 Recent reports from publications like Reuters and The Wall Street Journal have stated that there will be multiple screen sizes for the iWatch, ranging up to 2.5 inches diagonally. In terms of face shape, it’s said to be slightly rectangular with a curved screen. Along with multiple sizes, the iWatch is heavily rumoured to be available at different price points, suggesting there will be several band, colour and face options. This is perhaps the biggest indicator yet that Apple will be trying to position the iWatch as a true fashion accessory. It’s too early to say what our verdict of an Apple iWatch would be, considering we don’t even know what it would look like or how much it would cost. However, given the tech powerhouse’s track record, we have high hopes. The company’s recent hiring of former vice-president of sales and retail for TAG Heuer, Patrick Pruniax, for an unnamed role is also interesting – if he manages to bring some of the luxury prestige associated with the TAG brand to Apple they are sure to be on to a winner. A. Sauvage’s new phone-charging trousers – in association with Microsoft and Nokia – were revealed in his recent SS15 collection, aptly titled ‘Modern Man’. In what are said to be the first of their kind, the trousers seamlessly integrate an inductive charging plate in an additional front pocket to automatically charge your Nokia Lumia smartphone. We’re told the trousers will be available for pre-order at Amazon soon. Could anything be more useful? We all know how irritating it is when our phone’s battery drains quickly, so this could be a stylish solution. These inconspicuous chinos look nothing like traditional wearable tech pieces and would slot straight into your existing wardrobe like they’ve always belonged. If this is the future of wearables then we are most definitely ‘in’. As for creating an outfit, treat them like any other pair of versatile trousers by coupling with a polo and lightweight bomber jacket/Harrington. Finish the look off by rolling up the cuffs and wearing a pair of brown suede desert boots for an effortlessly cool summer evening look. Wearable tech is a relatively new phenomenon, so isn’t yet widely available to buy. But before it begins to hit high street stores, expect to see pieces popping up all over the internet. As mentioned above, Amazon has been quick to congregate what’s available by launching a dedicated wearable tech store. With more than 100 different wearable devices featured, you’ll be able to find smartwatches, smartglasses, wearable cameras and activity trackers. If you’re after a more stylish way to buy your wearable gadgets, Mr Porter is widely expected to sell Google Glass when it becomes available in the UK, with the technology already available on the luxury retailer’s US site. If all goes to plan and the offering is a success, expect to see more wearable technology pieces on our favourite online designer retail destination. It’s still hard to say just how much wearable technology is going to catch on in the mainstream, although recent developments have reminded us to keep an open mind. Many of the products we’ve looked at today are still yet to launch in the UK, while some haven’t even been officially confirmed. But if we start to consider ways of incorporating wearable technology into our wardrobes now, we’ll be one step ahead. 2014 might not be the year we completely swap our smartphones for smartwatches and surf the net through our specs, but big changes are definitely afoot. But now you’ve heard from us, we’d love to hear what you think. Will you be sporting wearable tech in the near future? If so, what are you planning to wear it with? Or does the whole thing seem like another fad that will simply pass by?